As the nail-biting tournament in South Africa dominates this month, here we have: 1940s sport socks. I think they mean a nice decorous sport like tennis, don't you? Red and white is the original colour scheme from the 1940s. (Possibly the original did not include quite such a Dayglo shade of red.) However, the pattern seems vaguely Scandinavian and wintery to me - I could see them perhaps in Christmas colours of a more muted red with green. Starting at top with the cuff, using the main colour, cast on 64 stitches on three needles (21,22, 21). Join in a circle, being careful not to twist the stitches, and knit 2 rounds. 3rd Round: * k1 contrast (C), k1 main (M); repeat from * to end of round. 4th Round: * k1 M, k1C; repeat from * to end of round. 5th and 6th Round: knit all round in M.
7th Round: * k1C, k2M, k2C, k2M, k3C, k2M, k2C, k2M; repeat from * to end of round. 8th Round: k2C, * k2M, k2C, k2M, k1C, k2M, k2C, k2M, k3C; repeat from * all round, ending k1C. 9th Round: * k1M, k2C, k2M, k2C, k3M, k2C, k2M, k2C; repeat from * to end of round. 10th Round: k2M, *k2C, k2M, k2C, k1M, k2C, k2M, k2C, k3M; repeat from * all round, ending k1M. 11th - 14th Rounds: Repeat 7th to 10th rounds. 15th Round: * k1C, k2M, k2C, k7M, k2C, k2M; repeat from * to end of round. 16th Round: as 8th round. 17th Round: * k1M, k2C, k4M, k3C, k4M, k2C; repeat from * to end of round. 19th Round: * k1C, k4M, k2C, k3M, k2C, k4M; repeat from * to end of round. 20th Round: as 8th round. 21st Round: as 7th round. 22nd and 23rd Rounds: knit all round in M.
24th and 25th Rounds: repeat 3rd and 4th rounds. 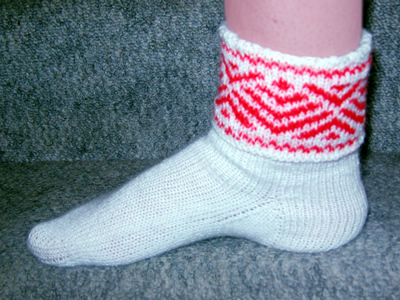 26th and 27th Rounds: knit all round in M.
Break colour C and continue in main colour only. Turn the work inside out to make a fold-over cuff and start to work the rounds in the opposite direction. Work in k2, p2 rib for 3 inches [Editor's note: about 30 rows. ], decreasing 8 stitches in the last round only, by knitting together every 7th and 8th stitch. Now work in stocking-stitch (knit every round) for 2 inches. 1st Row: slip 1 stitch knitwise, knit across remaining stitches. 2nd Row: slip 1 stitch purlwise, purl across remaining stitches. Repeat these last 2 rows alternately until piece measures 2 inches. Next Row (right side facing): knit across first 16 stitches, k2tog; turn. Next Row: p7, p2tog; turn. Next Row: k7, k2tog; turn. Repeat the last 2 rows alternately until 8 stitches remain on heel needle. Next Round: needle 1: knit across heel needle, then pick up 14 stitches down left side of heel; needle 2: knit across next two, needles (thus transferring these stitches on to one needle); needle 3: pick up 14 stitches across other side of heel and k4, from needle 1. Hereafter, work in rounds of stocking stitch but, on every other round, k2tog at end of first needle, and (s1, k1, psso) at beginning of third needle until 54 stitches remain. Work straight until piece measures 2 inches less than that required for overall foot length. There should be 13 stitches on first needle, 28 on the second needle, and 13 on the third needle. End of round is centre of sole. Work 1 round, decreasing at each end of second needle, then one round straight. Now there are 13 stitches on first needle, 26 on the second needle, and 13 on the third needle. Next Round: knit to within 3 stitches of the end of the first needle, k2tog, k1; on second needle, k1, (s1, k1, psso), knit to within last 3 stitches, then k2tog, k1; on third needle, k1, (s1, k1, psso), knit to end of round. Repeat the last 2 rounds until 16 stitches remain. Transfer the stitches on to two needles, having 8 stitches on each needle and divided so that sole lies flat. Sew in all ends. Fold down cuff. 3ozs Patons Real Shetland Wool. [2 ozs main shade and 1oz contrasting shade. Original uses white and scarlet]. A set of four No 11 needles, pointed at both ends. Length of foot, 9 inches (adjustable). M is main shade (white). 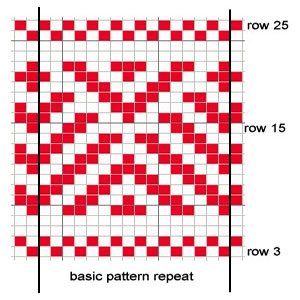 psso: pass the slipped stitch over, (also known as "ssk"; effectively you are "knitting 2 together through back loops"). The recommended wool was Patons Real Shetland Wool. I used Cygnet Wool-Rich 4ply. I chose this yarn as it seemed fine enough to achieve the required tension. I worked mainly on No 12 needles (one size smaller than specified) using No 11s for the Fair Isle section. However I think a conventional 4 ply at 28sts to 4 inches would make a better fabric.